I biked out to the bike trail, which is built on an old railroad line, including a gorgeous truss bridge (a lattice truss, to be precise) spanning the Connecticut River. 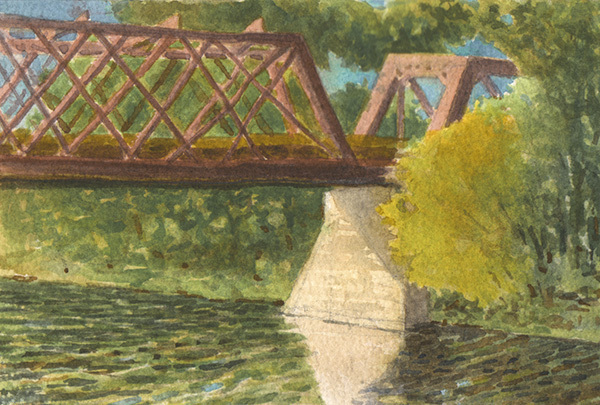 I rode over the bridge, then pedaled down to a dock on the river to paint the bridge from below. The bridge is somewhat tricky to draw, because although at first glance one would assume that the cross beams would be orthogonal to the sides, they are not, which means that if you draw it right, the perspective looks wrong. I was mostly interested in getting the play of light on the complex nineteenth century ironwork, foliage and river reflections.